Daily Mail | Take Home a Souvenir! Let’s face it, the gluten-free trend of 2014 isn’t going anywhere in 2015. Last year, “Free-From” foods started to appear in the first aisle (you know, the one by the door), #glutenfree trended on Twitter and most importantly, Dunkin’ Donuts finally managed to produce a gluten-free doughnut. According to The Telegraph, bread and pasta sales suffered a decline in sales throughout 2014 (-8.9% and -4.2% respectively), whilst “Free-From” sales reached £0.5bn for the first time. Despite less than 2% of the population suffering from a food allergy, millions of people are turning to gluten-free diets to lose weight and get healthier. The trend is big in America too, thanks to the likes of actress Gwyneth Paltrow and socialite Nicole Richie, who both stick to a gluten-free diet. Worth around $2.6 billion, the market has grown by 36% since 2006. According to the Mail, even Girl Scouts are now making gluten-free cookies. So, can eliminating gluten from your diet help you to a new feeling of health and well-being? Rita Greer, one of Britain’s leading health writers, has decades of practical experience in special diet cookery. 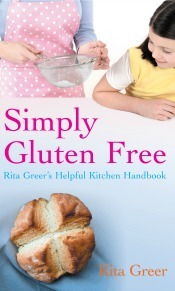 Her book, Simply Gluten Free, offers groundbreaking ideas and exciting recipes, including 100% gluten-free flour blend bread, for anyone who is seeking a gluten-free diet. Try a free sample recipe here. Buy a copy of Simply Gluten Free here. With more wonderful reviews coming in this week for a whole variety of different Souvenir Press titles, this is your chance to read extracts of them all in one place. As always, we’ve got a great mix of titles in here – just another reminder of the eclectic mix we publish here at Souvenir Press. Are you a blogger interested in reviewing any of the titles from Souvenir Press? Take a look at our blog post, ‘Calling All Bloggers’ for information on how to get in touch. I’ll be happy to send you a copy of our latest catalogue to peruse – just give me a shout. Have you seen a review that we’ve missed? Let me know! March 15th is World Sleep Day, an annual event to celebrate sleep and raise awareness on issues such as sleep deprivation, sleeplessness, the increasing use of sleep medication, and sleep disorders. When you’re sleeping well it’s wonderful; you wake up feeling refreshed, full of energy and ready to go. But if, like an increasing number of people in the UK, you have trouble sleeping, it catches up with you quickly. You’ll experience low energy, tiredness and low mood, and prolonged periods of sleep problems can lead to a host of other health problems. And the worst part is that sleep can often be a habit: if you aren’t sleeping well, you become stressed about not sleeping well, and so the next night you don’t sleep well because you’re worried about it. And if you’re sleeping well every night you’ll turn the light out and barely give it a thought. Dr Nerina Ramlakhan, author of TIRED BUT WIRED, wrote in the Daily Mail this week with handy tips to help your child get to sleep at night, but many of her tips will be very useful for adults too. Adopting a wind-down routine, not using technology such as iPads, computers and smartphones in the 90 minutes before bed, and creating a calm environment to sleep in are just some of the tips she suggests in that article, all of which are designed to help you or your child relax before bed. This World Sleep Day, stop and think: do you get a good night’s sleep? If so, that’s great. But if not, maybe it’s time to change your routine, and work out what you can do to help yourself. There are plenty of resources available on the World Sleep Day website, and, of course, you can read Dr Nerina Ramlakhan’s book TIRED BUT WIRED. Do Chocolate Lovers Have Sweeter Babies? How many times have you been told that chocolate is bad for you? Maybe it’s time to have a re-think: a recent study shows that during pregnancy, and in moderation, chocolate could actually be beneficial for both mother and baby. In the Daily Mail today, and on their website, you can read an exclusive extract from Jena Pincott’s new book Do Chocolate Lovers Have Sweeter Babies? published later this month by Souvenir Press. It uses the latest medical understanding to uncover the surprising science of pregnancy, and answer some of the most common questions. From morning sickness to the shape of your bump, find out what your body is telling you about your unborn child. It turns out that how your body changes during pregnancy can reveal a lot about what your baby will be like when he or she arrives. You can predict their tastes and their temperament, and there’s even a way to predict the gender of your unborn child before the 16-week mark which is generally recognised by doctors as the earliest date when you can tell with any accuracy whether your baby will be a boy or a girl. Published simultaneously in hardback and paperback, you can find full information about Do Chocolate Lovers Have Sweeter Babies? on the Souvenir Press website. Welcome (Back) To Biscuit Land! At the end of last month we saw our book WELCOME TO BISCUIT LAND featured in The Daily Mail (read our blog post about it) in a fantastic two-page spread prior to publication. The book has now been featured in The Observer yesterday (Sunday 14th) – this time it was given four pages in the magazine, but if you missed it you can read the extract online here. The book is out now, and you can find it in most Waterstones stores, as well as online – Amazon, The Book Depository, and in e-book format for Kindle, iBooks, Kobo, Sony and more. With rave reviews also coming in from customers on Amazon (at time of posting there are five reviews on the site – all five stars), it is clear that WELCOME TO BISCUIT LAND is touching the hearts of everyone who reads it. You can also like the book on Facebook, and read an interview that Jessica did with Disability Now. Welcome to Biscuit Land, everybody! Published at the start of next month, WELCOME TO BISCUIT LAND by Jessica Thom is one of Souvenir Press’s big titles for this autumn. Jessica has Tourettes Syndrome, and the book follows a year in her life and all the ups and downs that go with it. The book was featured in a huge double-page spread in yesterday’s Daily Mail, and the extract also appeared on their website (linked) – and that’s just for starters. No doubt you will be hearing much more from Jessica in the weeks to come. WELCOME TO BISCUIT LAND is published at the start of next month, but you can pre-order it now from Amazon at the discounted price of £7.00 (RRP £12.00). One of this year’s most unusual stories, the book features a glowing foreword from Stephen Fry, who met Jessica when she appeared on his television show, Stephen Fry’s Planet Word. Jessica’s words are courageous and optimistic in the face of the major challenges she faces every day. Moving, entertaining and unique, but never anything short of inspiring.